This is the beautiful site on the Craigantlet crossroads where we are building our new church building. In 2011, we took a step of faith and instructed the builders to lay the foundations. The artist’s impressions help to show a little more detail of how it will look once each phase of the building is complete. Initially, we will only be constructing phase 1 which will accommodate the main hall, temporary kitchen and toilets together with some small meeting rooms. The hall will seat approximately 130 people extending to 170 when phase 2 is completed. 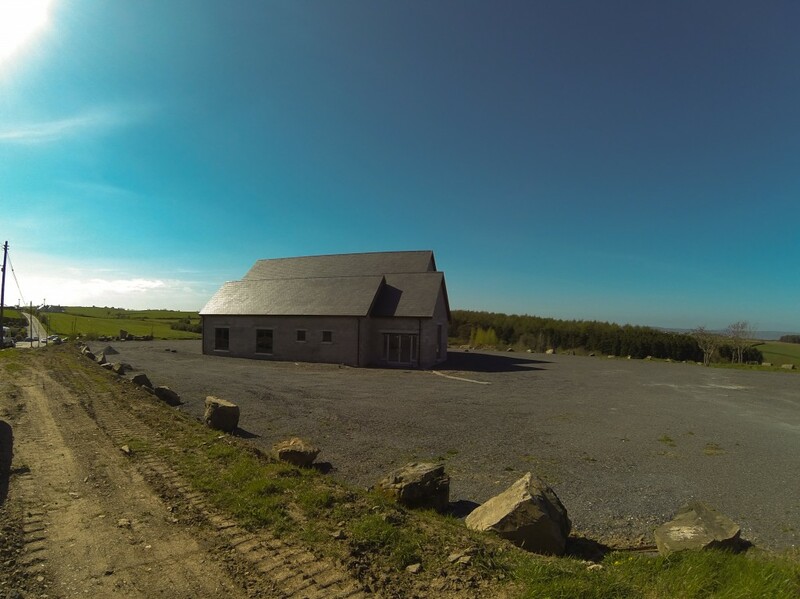 We are very grateful to the Lord and all of those who have helped us this far and we are indebted to all those in the area of Craigantlet who very generously gave us the funds to build the foundations, the steel frame work and to help us construct the “super structure” phase. one or a better one, just one for the local community to call church and home. Our desire is that God will bless the new ministry as much as He blessed the old and Craigantlet will once again have a church in its very heart both geographically and spiritually. Many have asked over the years, “Why build another church?”. Our response has and remains that we are not building another church but we are building another chance for God’s hurting people in Craigantlet to experience the amazing grace of God. Crossroads Church Craigantlet, not another church…but another CHANCE. As we look forward, we also look to God that he will continue to bless our efforts as we seek to complete this work. We find many parallels of our own experience with that of Nehemiah whose passion to build the house of God persuaded him to request help from many people, even King Artaxerxes who responded with great generosity. Ultimately however, it was the people of God who delivered the final result and the book of Nehemiah records their wonderful attitude. “And I told them how the hand of my God had been favourable to me, and also about the King’s words which he had spoken to me. Then they said, let us arise and build So they put their hands to the good work” – Nehemiah 2:18. The vision was shared and the people responded with joy and enthusiasm. Today we share our vision for the future and trust that many will respond with similar enthusiasm to help us build the “House of God”.